Hillary Clinton's Mother Dies At 92 : The Two-Way She was "intellectually broad-minded" and instilled in her children "a pervasive sense of family and love for one another," journalist Carl Bernstein wrote of the former first lady's mother. 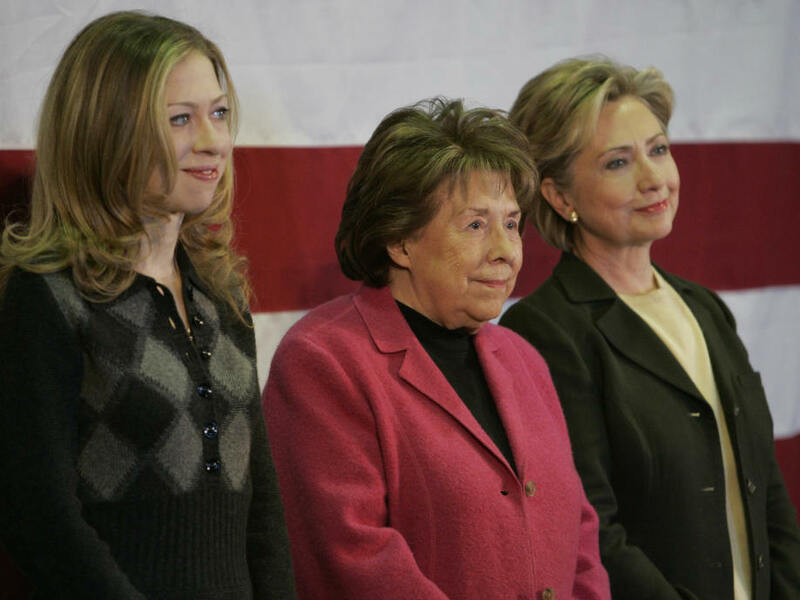 Dorothy Rodham (center) with her daughter Hillary and granddaughter Chelsea at a January 2008 campaign event in Iowa. Secretary of State Hillary Rodham Clinton's mother, 92-year-old Dorothy Howell Rodham, has died. "Dorothy Howell Rodham was born in Chicago on June 4, 1919 and died shortly after midnight on November 1, 2011 in Washington, D.C., surrounded by her family. Her story was a quintessentially American one, largely because she wrote it herself. She overcame abandonment and hardship as a young girl to become the remarkable woman she was — a warm, generous and strong woman; an intellectual; a woman who told a great joke and always got the joke; an extraordinary friend and, most of all, a loving wife, mother and grandmother. "Dorothy is and always will be lovingly remembered by her daughter and son-in-law, Hillary Rodham Clinton and Bill Clinton; her sons and daughters-in-law, Hugh Rodham and Maria Rodham and Tony Rodham and Megan Rodham; her grandchildren, Chelsea Clinton and her husband Marc Mezvinsky, Zachary Rodham, Fiona Rodham and Simon Rodham. She leaves behind many friends from all stages and places in her life, friends from California she met in high school, friends from Little Rock and Washington with whom she explored the world, the people who were first her doctors and then became her friends at George Washington Hospital, to the people she met through her children and grandchildren who became as much her friend as theirs. "To honor Dorothy, her family will hold a private celebration of her life for family and friends. In lieu of flowers and in line with what Dorothy would have wanted, the family have asked that any one who would want to do so would make a donation in Dorothy's memory to George Washington Hospital, where she received excellent care and made terrific friends over many years; to the Heifer Project, her Christmas gift of choice in 2010 and an organization dear to her heart; or to a local organization meaningful to the giver that helps neglected and mistreated children, a blight Dorothy was determined to remedy until her last day because she knew too well the pain too many children suffer. Her family is and will be forever grateful for the gift of Dorothy's life and for the memories they will treasure forever." "As intellectually broad-minded as her husband was incurious and uninterested, as inclined to reflection as he was to outburst, [Dorothy Rodham] fulfilled her lifelong goal of attending college in her late sixties (majoring in psychology), after she and her husband moved to Little Rock in 1987 to be near their daughter and grandchild. Constantly evolving and changing (like her daughter), she managed almost invariably to find a focus for her energy and satisfaction despite the dissonance of a difficult life at home. As her husband descended, she even became something of a free spirit, at turns sentimental, analytical, spiritual, and adventurous. (Her favorite movies were not those of her childhood, but The Adventures of Priscilla, Queen of the Desert–an Australian drag queen romp–and the bloody classic Pulp Fiction.) Dorothy taught classes at Sunday school (as would her daughter); Hugh didn't go to church on Sundays, saying he'd rather pray at home."